Your LinkedIn profile is essentially a platform to shape how others see you, highlight your abilities, products, or services, and explain how your work impacts lives. Yet many people simply copy and paste their resume and expect job offers and networking opportunities to start rolling in—but that isn't how it works. 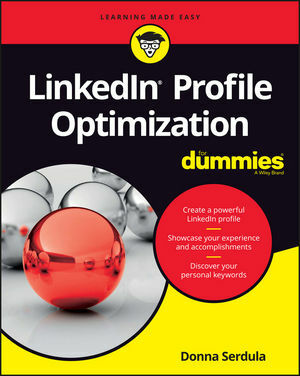 LinkedIn Profile Optimization For Dummies shows you how to create a profile that enhances your personal brand, controls how others see you, and shapes a successful future for your career. You never get a second chance to make a great first impression, and LinkedIn Profile Optimization For Dummies helps to ensure you're presenting yourself in the best possible light. Donna Serdula is the leading authority on LinkedIn profile optimization. She grew her profile consulting business from a one-person enterprise to a team of 40 serving individual, corporate, and military clients, and is much in demand as a speaker. Visit her website at www.linkedin-makeover.com, and follow her on Twitter at @donnaserdula.